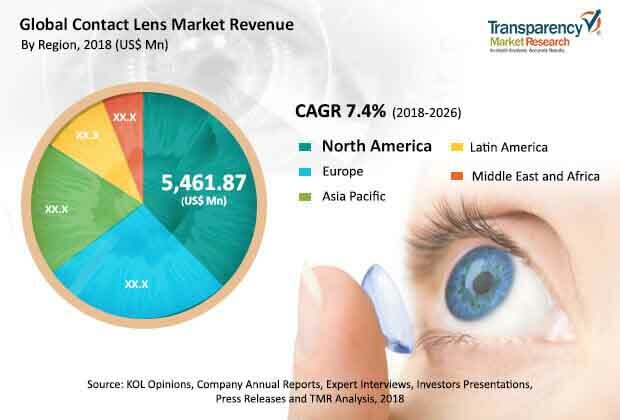 Transparency Market Research (TMR) has published a new report titled, “Contact Lens Market - Global Industry Analysis, Size, Share, Growth, Trends, and Forecast, 2018–2026”. According to the report, the global contact lens market was valued at US$ 11,155.7 Mn in 2017 and is anticipated to expand at a CAGR of 7.4% during forecast period from 2018 to 2026. Growth of the global contact lens market is attributed to development of new products, technological advancements, and demand in emerging economies during the forecast period. The contact lens market in Asia Pacific is anticipated to expand at a high CAGR of 8.0%, driven by unmet needs, increase in participation of regional manufacturers, expansion strategies adopted by major manufacturers to increase geographic reach, and increased focus on research and developmental activities. Contact lenses are used for therapeutic as well as cosmetic purposes. Rise in demand is anticipated to drive the global contact lens market during the forecast period. Moreover, surge in demand for cost-effective and highly efficient contact lenses that provide more comfort to the wearer has led to increase in the number of new product launches. This factor is expected to present lucrative opportunities in the global contact lens market during the forecast period. Major manufacturers strive to expand product portfolios by launching new products with advanced technologies to provide added comfort and better vision. In March 2017, Alcon received the FDA approval for AcrySof IQ ReSTOR +2.5 D Multifocal Toric IOL with ACTIVEFOCUS optical design for uncompromised distance vision and presbyopia correction in patients with astigmatism. Major restraints of the global contact lens market are side effects caused due to long term usage and stringent regulations. Based on product, the global contact lens market has been bifurcated into soft lenses and gas permeable lenses. Technological advancements to improve efficiency and reduce the risk of side effects caused due to long term use are anticipated to drive the market. Contact lenses are used by individuals with myopia, presbyopia, astigmatism, and other types of corneal irregularities for vision correction. Demand for cosmetic contact lenses has increased among the young generation to enhance their look. Manufactures are partnering with research institutes for the development of vision correction therapies, to expand product portfolio, and invest in manufacturing facilities to increase production capabilities to meet the rising demand. On April 11, 2018, Johnson & Johnson announced the launch of ACUVUE OASYS contact lenses with Transitions Light Intelligent Technology. Major restraints of the global market are side effects caused due to long term usage, and stringent regulations. In terms of design, the global contact lens market has been divided into spherical, toric, multifocal, and others. The spherical segment is anticipated to account for a major share of the global market during the forecast period. However, demand for multifocal lenses and toric lenses has increased due to rise in patient population with near and farsightedness. The trend is anticipated to continue during the forecast period. The multifocal and toric segments are expected to account for more than 25.0% market share in 2026. Growth of the segments is attributed to increase in product launches and strategic collaborations by manufacturers to expand geographical footprint. For instance, in July 2016, Alcon introduced Dailies Total1 Multifocal contact lenses with water gradient lens technology which helps in improved vision quality. Geographically, the global contact lens market has been segmented into five major regions: North America, Europe, Asia Pacific, Latin America, and Middle East & Africa. North America is anticipated to account for major share of the global market owing to presence of key players in the region, increase in research and development activities, and new product approvals. The contact lens market in Asia Pacific was valued at US$ 2,500 Mn in 2017 and is anticipated to witness strong growth during the forecast period. Increase in focus of key players to expand business in the region, large untapped population, and rise in awareness about health care are anticipated to fuel the growth of the contact lens market in Asia Pacific. For instance, in 2016, the Essilor Group increased its equity investment in Topcon Visioncare Japan (TVJ), a distributor of Topcon's optometry line products and Essilor's lens to opticians in Japan, to nearly 51%. The investment is expected to increase Essilor’s presence in Japan. Key players covered in this report are Johnson & Johnson, Alcon (Novartis AG), The Cooper Companies, Valeant Pharmaceuticals (Bausch + Lomb), Menicon Co. Ltd., STAAR Surgical, SynergEyes, Inc., Essilor, and Hoya Corporation, among others. Companies operating in the global contact lens market focus on strong strategic alliances with regional manufacturers to develop new products for the emerging markets in Asia Pacific and Latin America. For instance, in 2016, CooperVision acquired Soflex, a soft contact lenses and lens care solutions manufacturer based in Israel.